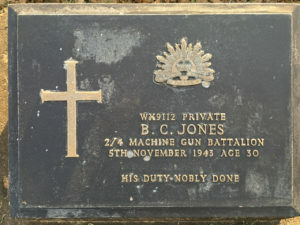 Kanchanaburi War Cemetery, Plot 1, Row N, Grave 13, Age 30. In Singapore Ben was selected with ‘D’ Force S Battalion to work in Thailand on the Railway. This Battalion along with ‘A’ Force Green Force Burma included the largest number of men from 2/4th. S Battalion firstly worked at Tarsau for a few weeks before arriving at Konyu II Camp in the Hellfire Cutting on 25th April 1943. Konyu II Camp conditions were harsh and the work cutting through the rock face took a terrible toll on the men working here. We cannot be absolutely certain of Ben’s movements after, there are no records however he was probably sent to Hintok or Kinsaiyok. It would have been from one of these camps he was evacuated sick from and sent to Chungkai. 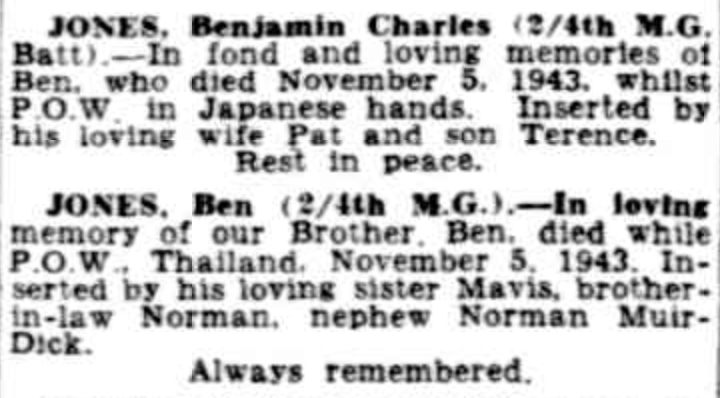 Today Ben rests at Kanachanaburi War Cemetery and is one of 91 men from the 2/4th. 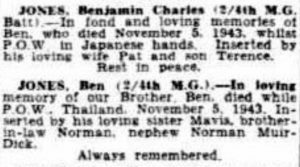 Ben was the eldest of 2 sons and 4 daughters born to Benjamin Jones and Maude Eliza Kerr who married in 1908 at Moorumbine, Beverley. 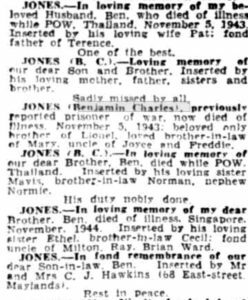 ‘Ben’ Jones (Snr) died in 1965 and Maude died in 1978. 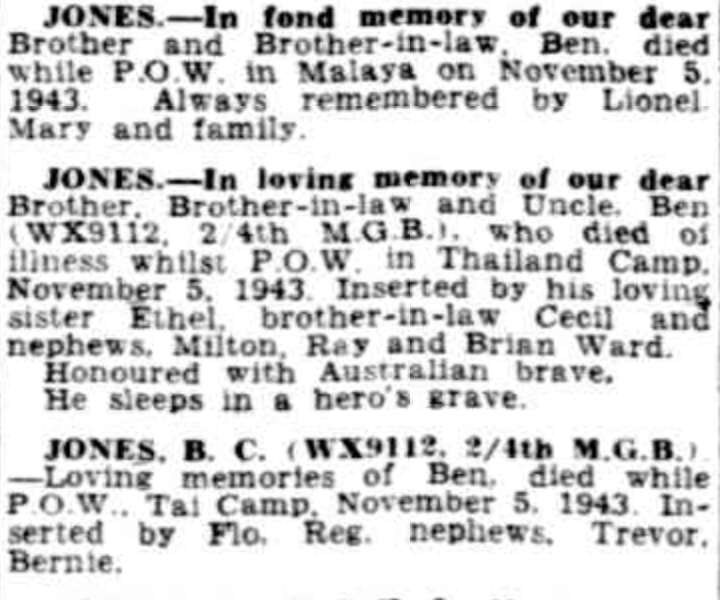 In the 1949 and 1954 Electoral Roll, Ben (Snr) and Maude Jones were living in Hopetown, Ben was a fisherman. 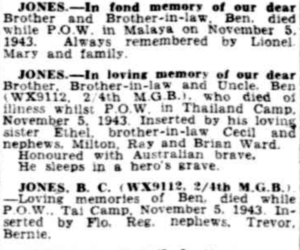 Ben Jones married Patricia Doreen Hawkins about 1941 and the couple had a son Terrence.